Vinyl is back with a vengeance. 2017 was the twelfth consecutive year that vinyl sales have risen. It’s also the year that I got the most questions from newcomers to the hobby about the best start turntables. Brands like Crosley and Victrola have become popular among newbie collectors due to their $60 price tags. But between the thin, weak speakers and heavy cartridges, these cheap players damage the listening experience—and your records. But if you’re looking for an affordable turntable that will give quality performance without breaking the bank, the Orbit Turntable from U-Turn Audio is a great choice. I’m hardly a beginner myself, but my secondary stereo definitely needed an upgrade. I purchased an Orbit Basic from a friend, and I am super impressed. The Orbit Basic is a very simple machine. It features a minimalist design with nothing but an on/off switch. There’s no button to switch from 33 to 45 rpm. To change the speed, you need to move the belt from one section of the spindle to the other. The belt is wrapped around a thick MDF platter that feels very sturdy. 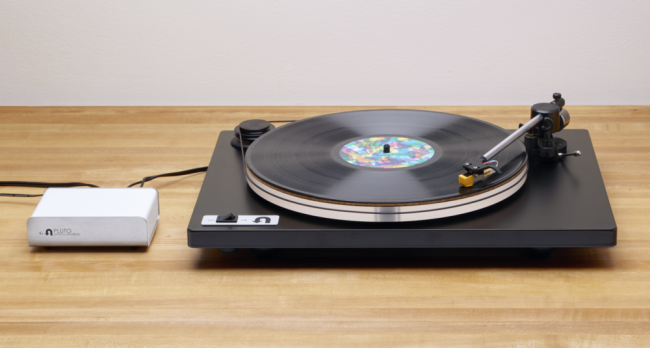 The body of the turntable is solid yet lightweight. The wiring is somewhat exposed underneath, but they don’t feel vulnerable. Rather, it’s just part of the minimalist aesthetic. But don’t let its simplicity fool you. It does everything it needs to do. And it does it well. While the Orbit Basic might be a bit more expensive than most other “entry-level” tables, it plays as well as some $500 models. Part of this is due to the included Audio-Technica CN562AL cartridge, which is light years ahead of the cartridges included with all of the suitcase record players. It also includes an adjustable counterweight, which makes a huge difference. It also boasts a very low sound-to-noise ratio. And because of the thick platter and rubber feet, it suffers very little rumbling from bass frequencies. Which is good, because I listen to my music loud. It’s important to remember though that because this is a standalone turntable, you’ll need to get some more components. A stereo receiver and bookshelf speakers would be great for the casual listener, or you could go with a pair of powered speakers and a phono preamp. Admittedly, this has a much higher startup cost than a $60 Crosley. But if you’re serious about your music-listening experience, it’s worth it. The Orbit Basic retails for $179 and it is available on U-Turn Audio’s website. What I Like: high-quality performance, due to its solid construction. And it looks great. What Needs Improvement: the belt is a little difficult to change. I prefer a speed switch.